San Antonio's CPS Energy continues to utilize and study the benefits of sun power as a valuable generation option for their customers. CPS Energy has been recognized on the local, state and national level, with the Texas Public Power Association (TPPA) for it's outstanding system achievements. To win the award, the TPPA member must be widely recognized in the public power field, have enhanced the prestige of public power, and have improved service to customers. Among it's most recent achievements, CPS Energy reduced its carbon emissions by nine percent in 2012. Emissions of nitrogen oxides, which can lead to ozone action days, also have been cut by more than 2,000 tons, or 70 percent, since 1997. The Lone Star chapter of the Sierra Club praised CPS Energy for its environmental efforts, which include a commitment for 400 megawatts of clean solar energy that will also lead to jobs, economic development and investment in local education. Already, CPS Energy has 44.8 MW of solar power in operation, with an agreement in place for another 400 MW of solar power. A first-of-its-kind technology has been combined with an existing biogas-to-energy system to turn a local landfill into a sustainable energy park. The green venture covers portions of closed areas of the Tessman Road Landfill with flexible, laminate-type photovoltaic solar collection strips. These strips capture the sun's rays for conversion into electricity. The 14-MW Blue Wing Solar photovoltaic installation in southeast San Antonio began generation in 2011. 30.4 MW of solar power are provided through three SunEdison facilities — two Centennial Solar Farms in southeast San Antonio generating 19.8 MW, and a 10.6 MW solar facility in Somerset, Texas. All of the farms were fully operational in the summer of 2012. CPS Energy and OCI Solar Power have an agreement for the construction of a 400-MW solar project. 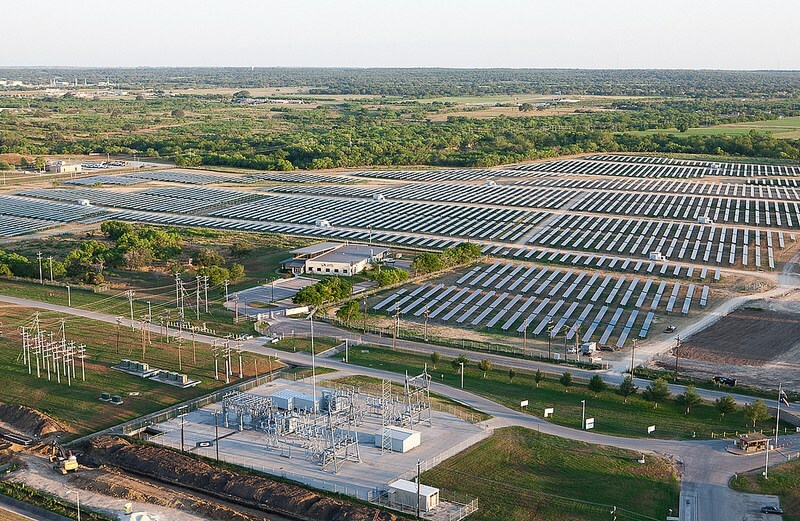 The project will be the largest in the nation among municipal utilities, and will catapult Texas into the top five U.S. solar producing states.